The Finnish folk and rock scene has many gems hidden to the rest of the Western world. If you're not acquainted with the progressive grooves of Sammal, the ecclectic ramblings of Paavoharju or the laid back finesse of Riitaoja, all I've got to say is get going! One of the many surprising acts that the land of a thousand lakes has to offer is Death Hawks, a group which has been consistently releasing albums and touring Europe since 2010. While the morbidly titled debut from 2012 hinted at sun-powered seventies-gone-modern psychedelia through compository valleys and mountains alike, and the self-titled follow-up from the year after flew among the stars on a hypnotically interstellar space rock trip, the Finnish group's third album - Sun Future Moon - opts for a greater scope than the preceding releases. 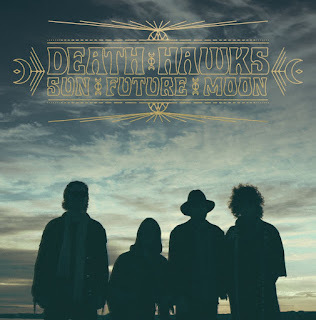 The dreamy ambience that Death Hawks has integrated into their sound on the previous album features strongly on Sun Future Moon, contributing with alluring synths, smooth bass and wistfully effective guitars and strings right from the start with the first offering of organic folk rock "Hey Ya Sun Ra". "Sun Future Moon... ...elaborates on the sound and style they found on their two earlier efforts..."
No doubt about it, Sun Future Moon rings like a true Death Hawks album and showcases a band still going strong in terms of songwriting on their triennial album. While Sun Future Moon shows what we already know the band is capable of, it also elaborates on the sound and style they found on their two earlier efforts, and is - like nature - in an ongoing state of evolution. The A-side of Sun Future Moon provides a stern, traditional approach, while the B-side is a bit more on the daring side of things. As an example "Dream Life, Waking Life" comes off as a Riders On The Storm-esque psychedelic lounge piece, while the follow-up track "Heed the Calling" has late sixties earworm written all over it. And next, airy pop track "Wing Wah" takes over, followed by a fragile composition of spaceous guitar ambience akin to Black Sabbath's Planet Caravan. The captivating bass play of Riku Pirttiniemi has, to my great pleasure, been promoted to a more prominent position, driving forth the lingering synths and gentle instrumentation with a sense of instinctual purpose. As usual Tenho Mattila's sax, synths and keys are juxtaposed against Teemu Markkula's more tenacious vocals, with the percussion provided by Miikka Heikkinen returning to a more traditional rock-setup, as opposed to the more tribal sounding rhythm section of the self-titled sophomore album. In many ways Sun Future Moon has succeeded in becoming a colourful amalgam of every essential element of Death Hawks. 8/10 guitars.